Our best day in London wasn’t the day we waited in line outside the Tower of London, or strolled across London Bridge. It wasn’t the day we swung on and off red buses, marking landmarks off an increasingly creased map, or counted the chimes of Big Ben. It was the day we got unreservedly lost within Kew Gardens. Kew Gardens is 121 hectares of open space right outside the city center. It’s the kind of place you start out with a map and a list, but along the way they get quietly tucked away lest they spoil the surprise. While tourists outside the garden walls brushed shoulders with crowds, we brushed shoulders with ferns and rhododendrons. Our London landmarks were a stray fox and the English chill that hugs your jacket that little bit closer. Lines of people were replaced by lines of daffodils. When you spend your day walking around a garden, you get space to think. To have the discussions you wouldn’t have otherwise. To linger. To take a breath while the rest of London bustles around you. And there were other days where we peeked outside and battled the crowds and came home weary and full of stories. But for one day, two introverts found a spot just for them in the middle of London. If your idea of traveling is fleeing to a deserted island you can only reach by boat – then, bravo. And that option is always there. But for the moments when you want to eat croissants under the Eiffel Tower or gaze at the pyramids of Giza, you have to battle a few crowds. Talk to a few strangers. Possibly in an unfamiliar language. This isn’t always easy for introverts or highly sensitive people. But to help you get on that plane, here are nine ways I do it. 1. Seek out alternative tourist attractions. Kew Gardens is a spot in London that possibly not many tourists see, and it is enchanting. Guidebooks are useful, but dig below those first few page. When on vacation, it’s easy to get caught up in doing “all the things” and forget how you usually like to spend your days. Start with that principle and go from there. Seek out: botanic gardens, quiet laneways, coastal spots. 2. Go early. Head out before the tour buses start. My favorite place in Rome was the Palatine Hill. Our early flight on our final day meant we needed to walk there before the tour buses had their first run, and I wish we’d used that strategy sooner. The sprawling, craggy layout meant we rarely saw the few other tourists who were up that early. I thought of it as the only quiet space in Rome. 3. Take lunch breaks. Since introverts need time away from people to recharge their batteries, use lunch as the perfect opportunity to take a break from the hustle and bustle. Instead of eating at a popular food precinct, grab supplies from a supermarket and head to the city park for a picnic. Seek out the quietest café down a laneway. Or eat in, and use it as an opportunity to plan your afternoon. 4. Travel with (extroverted) friends. 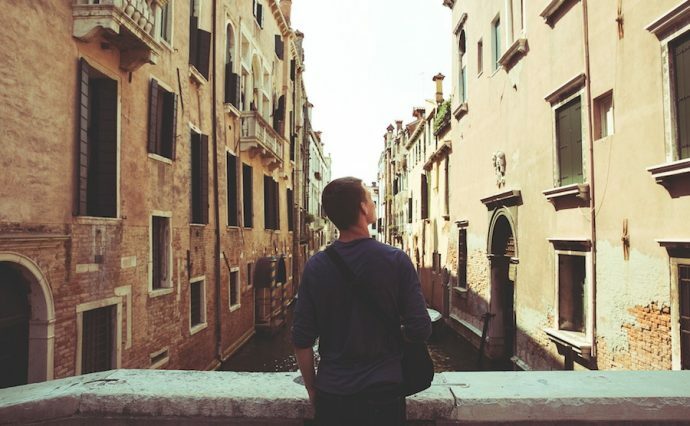 This one may seem counter-intuitive, but having outgoing travel companions can help smooth some of the more stressful parts of traveling for introverts. (And by that I mean: handle the tricky stuff for you.) Consider: continually having to ask strangers for directions or having to negotiate prices. 5. Go on the road. Some of my favorite travel days are the days spent driving from one location to the next. Not only is it a great way to explore a new place, but they’re useful recharge days before you tackle a new city. Road trips are perfect for long conversations, listening to music, reading or listening to audiobooks, or just thinking – when else do you get to indulge like this? 6. Go off season. Find out the busiest season for your chosen destination and plan accordingly to avoid battling additional crowds. You don’t have to miss out – winter is one of my favorite times to travel — and it shows you a different side to a city. 7. Stay away from tour groups. Do you want to introduce yourself to the group, make small talk, and get called on to participate? Me neither. Buy a guidebook and have fun exploring by yourself. 8. Maintain your chosen rituals. I run most days – it’s my alone time; it’s how I solve problems – so I always carve out time to maintain this ritual while I’m away from home. For you, it may be relaxing with a pot of tea in the evening or tuning out with music in the middle of the day – whatever it is, carve out that time for yourself, even while on vacation. 9. Don’t pack too much in. Stick to the introvert principle of quality interactions over quantity for this one. Don’t try to see everything – pick a couple of must-sees, and then play it by year. Let yourself wander. Spend an afternoon with nothing planned other than the walk back to the hotel. Discover an independent bookstore and happily retreat there for an hour. It’s far better to have enjoyed yourself than to have seen everything on someone else’s must-see list. Laura is an ISFJ married to an ISTJ and has a border collie who’s more extroverted than both of them. She lives in Brisbane, Australia, where the weather drags her out of the house, though she prefers to hibernate in the evenings. Her favorite things are disappearing behind a book, going for long runs, swimming in the ocean, and writing at www.downhickorylane.com.